This is a good comprehensive summary of where we are at this point in the ongoing BRICS lead global reformation. We, the new media, are all enjoined to spread this good news to those who are still consuming mainstream media trash. They all deserve to know what is forthcoming. 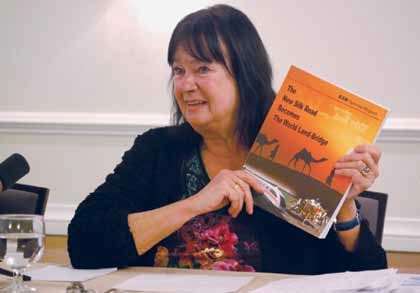 Helga Zepp-LaRouche gave this keynote address to the Dec. 2 EIR seminar in Washington, D.C., on the New Silk Road project. I think it is a fair statement to say that the future destiny of mankind will depend on the question of whether the United States and, to a secondary degree, Europe, will take up the offer made by President Xi Jinping to President Obama at the press conference during the APEC conference, where Xi invited the United States, and other major nations, to cooperate with a whole set of policies promoted by China and also the BRICS countries. This set of policies is, naturally, on the one side, the New Silk Road. It is the idea of a new credit mechanism around the Asian Infrastructure Investment Bank, the AIIB, but also the new Silk Road development Fund, and similar mechanisms and new institutions which I will go into in the course of my presentation. Now, why do I say that the fate of civilization, in all likelihood, will depend on that that particular offer by Xi Jinping to the Atlantic world, in particular, to join? Because it’s very clear that the policy, which is presently the policy of the trans-Atlantic sector—the United States, NATO, the British, the EU—toward Russia and China, is one of confrontation. Toward Russia, it’s more obvious, since the outbreak of the Ukraine crisis—which, if you are honest about it, is entirely the fault of the EU, because the condition on which the EU Association Agreement was offered, was already a kind of first step in the direction of regime change against Russia. And all the subsequent developments are really a chronology, in which Russia all the time reacted, and therefore is really not the guilty party, despite the fact that the mainstream media in the United States and Europe tell you the exact opposite. So, this policy toward Russia and China, which consists of a color revolution—that goes back since the end of the Soviet Union. [U.S. Assistant Secretary of State] Victoria Nuland has praised herself for having spent $5 billion from the NED [National Endowment for Democracy] alone to accomplish that. But it also includes the sanctions. Russian Foreign Minister Lavrov has been explicit to say that the aim of the sanctions is not to change the policy of Russia, but to get rid of [President] Putin. And naturally, the NATO expansion eastward, which breaks all promises made to Russia at the end of the Soviet Union, is part of the same game. And the same organizations which are in the destabilization in Eastern Europe, are also heavily involved in the Hong Kong demonstrations. And there the aim is exactly the same. And if you look at the front page of the Washington Post this morning, you have another example of the black propaganda, using human rights issues, using issues of democracy; but if you really look at it, democracy in the United States is not in such good shape either. And in Europe, with the EU Commission, I think even the officialdom admits that we have a democracy deficit, to put it mildly. When President Xi Jinping makes this offer, it also comes at a point where the Atlantic sector is hovering on the edge of a new financial collapse. You have, on the one side, the collapse of the oil price, which in part is also economic warfare, because Saudi Arabia, at the recent OPEC meeting, flatly refused to adjust the production; and who is the hurt country? This is Iran, naturally, but it’s also Russia, in particular. However, as President Putin recently pointed out, this is one of the evil deeds that backfires, because it has now dropped the oil price to about $70, or even somewhat less yesterday, and that is creating a big problem for those oil companies, and shale oil companies, which have gone into massive debt. They’re indebted by about $1 trillion, but the repayment of that debt would require an oil price of $80 to $120; so one could make the comparison now, that the situation approaches a similar situation, like during the secondary mortgage crisis in 2007, when the collapsing mortgage prices triggered the big crash. And right now, the falling oil price could trigger a big crash. So, either the oil price shoots up dramatically, or a crash could happen. And that, naturally, on top of the situation that the too-big-to-fail banks are today about 30-40% bigger than in 2007, and if one of these banks would collapse, it could trigger the virtual evaporation of the entire financial system of the trans-Atlantic sector. So, therefore, when I’m saying that the acceptance of President Xi Jinping’s offer is a lifeboat for a bankrupt trans-Atlantic world, this is not an exaggeration. Now, first slide (Figure 1): This is a proposal we made, Mr. LaRouche, myself, and other members of our organization. When the Soviet Union collapsed—actually it started a little bit earlier—but when the Soviet Union collapsed in 1991, we proposed the Eurasian Land-Bridge, as a way to connect the population and production centers of Europe with those of Asia, through so-called development corridors. And we have campaigned for this program in the 24, or 25 years, since. That is why, when President Xi Jinping announced a New Silk Road last year in September in Kazakhstan, we were extremely happy. We were extremely happy because we had thought of this Eurasian Land-Bridge as a peace order for the 21st Century. And then, when in the Fall last year, he added the idea of a Maritime Silk Road, this program developed. Then, in May, you had the extraordinarily important strategic summit between President Putin and President Xi in Shanghai, where they had many economic and other cooperation deals, including the 30-year cooperation in the gas delivery from Russia to China. But then, the really big break came with the BRICS meeting in July in Fortaleza, Brazil, where virtually, the birth of a new economic system was announced. And at that point, you had not only the BRICS countries meeting, but in the following days, the heads of the BRICS states met with the leaders of the UNASUR [Union of South American Nations], of the CELAC [Community of Latin American and Caribbean States] of Latin America, and they agreed on many, many projects of cooperation. And since July of this year, a completely new dynamic has developed in the world, which most people in the United States and Europe have no inkling of, because the mass media are absolutely not reporting on it. But as you will see, from what I’m going to say, an explosion of big projects has been agreed upon, or already started, and it has spread an unbelievable optimism, whereby even nations which are not part of the BRICS or the CELAC or UNASUR, have been encouraged to implement projects which have been on the shelves for decades, but because of the IMF conditionalities, were not implemented. Because the IMF would always say, no, you can’t organize this project because you have to pay your debt first. 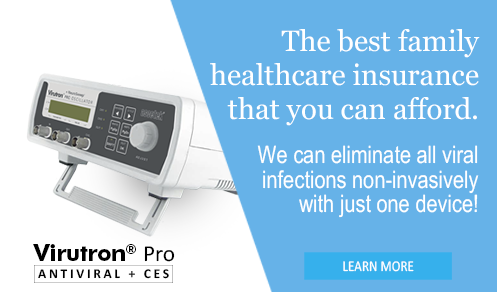 You have to cut your health system. You can’t invest in infrastructure. So, a lot of these projects were available, but they were not implemented. But with the new dynamic, this has completely changed. And, for example, China is now in the process of helping to build a second Panama Canal through Nicaragua. China is also involved in building, for the first time in history, a transcontinental railway from Brazil to Peru, and other routes are also envisioned. Other countries, like Egypt, are clearly in the dynamic of this optimism, and with the taking over of the government by General [Abdel Fattah] el-Sisi, they’re building now not only a second Suez Canal; el-Sisi has promised a job for every young person in Egypt. They’re building agro-industrial complexes. They’re desalinating ocean water, and many other such things. Besides China, which I will go into somewhat later, also India has completely been transformed, and there is an enthusiasm among the Indian population about the leadership role of Narendra Modi, the new prime minister, who has promised to build 100 new cities in India; to create 1 million new jobs every month. Now, that is an unbelievable change in the situation which really is—I have not seen in my whole lifetime, not during the time of the Non-Aligned Movement, at no time—that this really took place. And they agreed on many programs of nuclear cooperation among China, Brazil, Russia, Argentina, India. Also joint space programs. So it is a completely new situation. Now, before I go into these projects, I will address the issue which most people always ask: Who should finance all of this? It’s the most pressing issue people have. It shouldn’t be, but it is. There are dramatic changes occurring: China has organized the Asia Infrastructure Investment Bank, and on Oct. 24 of this year, the cooperation in this bank was signed by 21 Asian nations. The initial capital in this bank will be $100 billion. The BRICS countries had also agreed in Fortaleza to construct a New Development Bank, which has an [authorized] starting capital of $100 billion. The Shanghai Cooperation Organization is also creating its own bank. The South Asian Association of Regional Cooperation, the SAARC, which just had a conference in Nepal, also will create such a bank. There will be a New Silk Road development fund, to kick off the Silk Road, of $40 billion. The Maritime Silk Road will have an initial funding from China of $20 billion. And the BRICS countries also agreed on a so-called Contingency Reserve Arrangement, with capital of $100 billion, that is designed to help participating countries in fending off attacks from vulture funds. Because these countries have drawn the conclusion from the big Asia crisis, from 1997—when such speculators as George Soros speculated the Asian currencies, in a couple of weeks, down, by up to 80%—that they will now protect themselves with such a fund. If we can get the United States and Europe to join—which we are determined to really make the strategic issue number one—then even larger amounts of credit could be made available, and in that case, one would have to address the bankrupt trans-Atlantic financial system, and implement the Glass-Steagall reform, exactly in the way that Franklin D. Roosevelt did on the 16th of June 1933, and which led to a period of several decades of stability and growth in the financial system. In the Congress, and in the Senate, there were several bills introduced for Glass-Steagall. There are 200 national organizations in the United States which have signed a resolution for the implementation of Glass-Steagall. So it’s not just an idea; it’s a very real issue: how you address the non-resolved banking situation, which already in 2008, almost led to a meltdown of the world financial system, and obviously, [Glass-Steagall] needs to be revived. Now, the theoretical basis for the Glass-Steagall separation of the banks, will also mean going back to the American System of economy, something which is not so well known any more. But Alexander Hamilton, the first Secretary of the Treasury, implemented a credit system in the United States, which is very, very different than a monetary system. And that system was successfully revived by Lincoln, with the Greenback policy. It was implemented by Franklin D. Roosevelt with the Reconstruction Finance Corporation; and it was the model for Germany, based on the Reconstruction Finance Corporation, and with the help of the Marshall Plan, to rebuild Germany from a rubble field, and turn a completely destroyed economy into the most admired economic miracle in the world, up to the point when China had their own economic miracle. So, what we are proposing is not some wild, utopian idea, but something which always, when the United States was prospering, was the basis of the financial system. And it has been successfully applied in other parts of the world. Let’s go to the next slide (Figure 2). This is the Eurasian landmass, and to the right, you have South America. This is a combination of links among continents, islands, and development corridors, which, as a totality, is a World Land-Bridge. The first picture you saw was the Eurasian Land-Bridge which we proposed in ’91, and in the last 25 years, we have worked on the expansion of that original idea to become a World Land-Bridge. And this is now our updated version, and this report is a blueprint. If we want to get the world out of the mess, and if we want to have a peace order for the 21st Century, then that should be the issue of discussion of major governments around the world. I actually call on you, if you agree with only 90% of what I’m saying, then please help us to make sure, that everybody in the Congress, everybody in the government, everybody around the world, will talk about this. Now, I’ll just go through some of these projects, not extensively, but just to give you an idea about the incredible amount of things which are already in consideration, or, in part, in construction. First, we have Number 1; This is the second Panama Canal, which will connect the Pacific and the Atlantic Ocean. It will be going through Nicaragua, through Lake Nicaragua. It will be 278 km long. 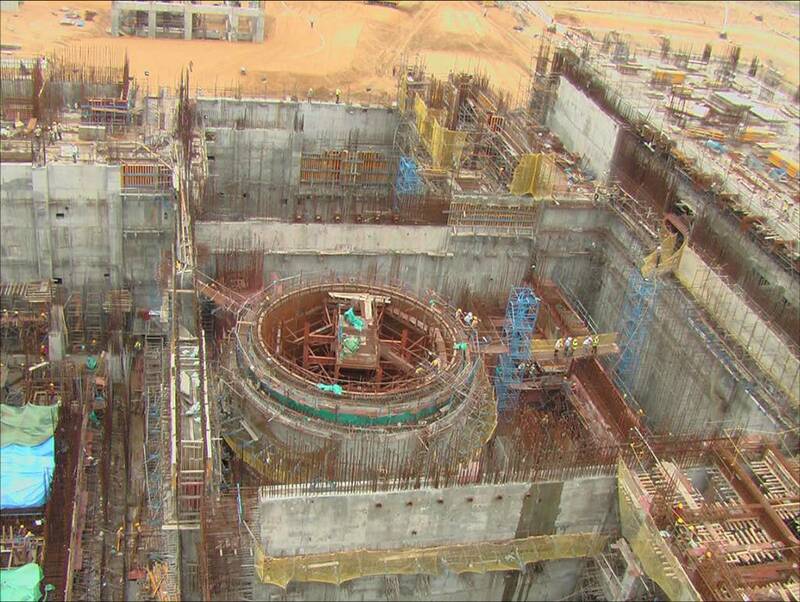 During construction, it will employ 50,000 workers. It will have two ports, one international airport, and naturally, a lot of supporting industries, like cement, steel, other infrastructure; so it will be a complete boost for the Nicaraguan economy, and it will take only five years to build, with mainly Chinese financing. The second project (Number 2), up in the North, is the Bering Strait tunnel. This is a proposal to connect Alaska and Siberia, and build a tunnel in the gap in-between. This tunnel would be 85 km long, and connect the transport systems of Eurasia with those of America. This has been on the table since the 1800s. It was also proposed that the Alaskan port will be called LaRouche City, and the Siberian port will probably be called Granberg City [after Russian Academician Alexander Granberg], one of the authors of this project from Russia. China has already expressed great interest to participate in the construction of this. Number 13 is the Sakhalin Island-Russia connection. This strait is 7.3 km at the narrowest point, and the idea is to build a tunnel from the southern end of Sakhalin Island, to Japan, and it would connect Japan with the Eurasian landmass. Number 4, a tunnel between Sakhalin and Hokkaido; either a tunnel or a bridge, which would then link the Russian island with the Japanese island of Hokkaido. This would be at a length of 45 km, and would also connect Japan by rail to the Eurasian continent. Number 5 is the Seikan tunnel, which opened in 1998. This is currently the largest and deepest tunnel in the world at 53.85 km, and was regarded as essential for the unification of the Japanese nation. Number 6 is a tunnel between Japan and Korea, which connects Japan and South Korea at a length of 128 km. Number 7 is the Bohai tunnel, which would be a tunnel under the Bohai Strait, of 100 km, making high-speed-rail connection between the two Chinese cities Dalian and Chantai, and this will take ten years to build. Number 8 is the Strait of Malacca Bridge, which connects Malaysia and Indonesia, and that is already being financed since 2006 by the Chinese Eximbank. This is ongoing. Number 10 is the Kra Canal, which would overcome the present bottleneck of the Strait of Malacca, which has very high traffic, and that will be either 50 or 100 km long, depending on the exact route. We have been campaigning for that since, I think, the ’80s, when Mr. LaRouche and I were conducting a conference in Bangkok, and now it is back on the agenda of the BRICS countries. Then, Number 12, the Suez Canal expansion: This now has transformed Egypt completely, because, with el-Sisi taking over the government, he has announced that he will completely change the Egyptian situation, promising a job to every young person, and they have already built an enormous amount of kilometers since the Summer of this year. Now, the expansion of the Eurasian Land-Brige: We have already proposed a couple of years ago, to expand it into Europe, the Mediterranean, and to Africa. Now, as you know, with the Troika, southern Europe is an absolutely collapsing part of the world. Greece, Italy, Spain, Portugal—these countries are dying. You have an increase of the death rate, the collapse of the birth rate, the suicide rate is going up, the health sector is collapsing, and the massive, brutal austerity policy of the EU Commission is simply ruining these countries. And therefore, for Europe, becoming part of this, is a question of survival. One project which we don’t have here is the Italy-Tunisia link, which is the idea to build a bridge between the mainland of Italy and the island of Sicily, and from there, a five-track tunnel from Sicily to Tunisia. And we just had a conference in Frankfurt, where one of the authors, the engineer [Dr. Nino Galloni], one of the designers, spoke at this conference. Number 14: This is the Strait of Gibraltar. This is a very exciting project, which could start tomorrow, because between Spain and Morocco, already a couple of years ago, a feasibility study was made, and presented in 2009 to the EU Commission, which naturally, because the EU is motivated by different concerns—namely, to save the bankrupt European banks—they have not gone ahead to implement that. But it could start immediately. Now, let’s go to the corridors. These are not just transport lines from A to B. 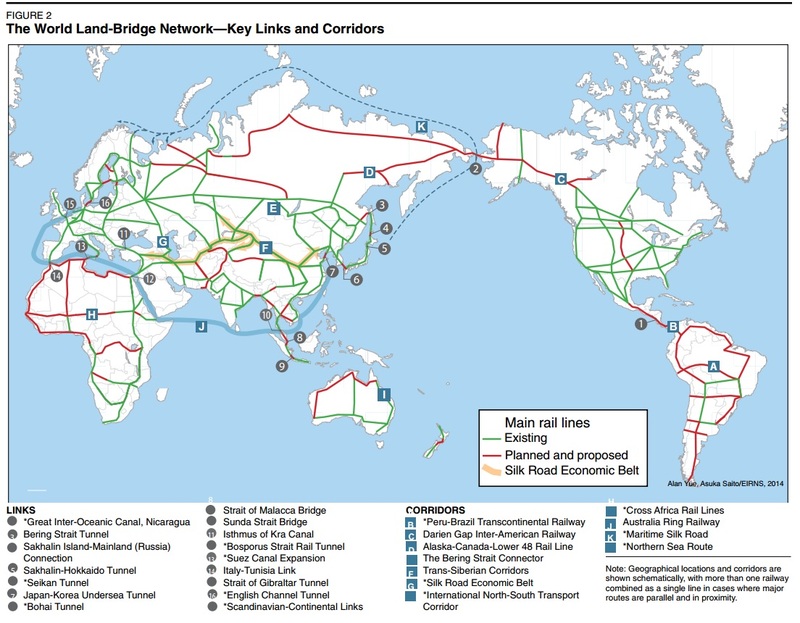 When we developed the first Eurasian Land-Bridge, Mr. LaRouche was emphasizing very much the need to build corridors. That is, if you build a transport connection, like the Eurasian Land-Bridge, this was the idea to have an integrated system of fast trains, of highways, of waterways, and then have a corridor of about 100-km width, and then put in energy production and distribution, communication. And that way, create the infrastructure conditions for investment in industry, industrialization of agriculture; and that way, create the same kind of conditions for investment, as you normally only have at seaports, river systems, or the oceans. So, you bring the infrastructure into the land-locked areas of the planet, and that way, have a basis of overcoming the underdevelopment. Now, Letter A: This is the transcontinental railway from Brazil to Peru. Letter B: The Darien Gap. This would connect the Inter-American Railway all the way from Alaska to Tierra del Fuego, in Argentina. Presently, that connection is interrupted for about 100 km by the so-called Darien Gap, through swampland and forest, and it would bring a tremendous economic benefit to connect that. Letter F is the Silk Road Economic Belt, which President Xi Jinping proposed, and that is already agreed upon, as of now, by 18 Asian and European countries. It will affect the economic life of 3 billion people on the planet. Letter H is a cross-Africa rail-line system. The left side is the existing railway, and you can see that Africa, at this point, does not have one rail line from Dakar to Djibouti, or from the Cape of Good Hope to Cairo, because the colonial powers only would build railways from the raw material mining, to the port. 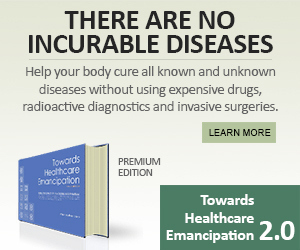 That condition also exists in Latin America. If you look at the maps of Africa and Latin America, you do not have an existing intercontinental infrastructure system, and therefore, if you want to develop these two continents, really, an integrated railway system is the absolute precondition. And Chinese Prime Minister Li Kejiang, who was in Africa this year, promised that China would help to connect all Africa capitals through a high-speed-rail system. And that is obviously extremely good; and the African countries are all much happier with such offers, than the Sunday sermons by EU officials, who say, you should do this, you should do that, but they don’t deliver any infrastructure or other things. Now, lastly, part of this is the Letter J, which is the famous Maritime Silk Road, which is really reviving the tradition, or the famous voyages, of the Chinese Admiral Zheng He in the 1400s, which was emphasized by President Xi Jinping also recently. Now, why is this so exciting? Because if you really think about the arc of human development, it’s a longer period—or not only human development, go back many hundreds of millions of years. And then you realize that the evolution of life occurred on our planet g from the ocean, to the landmasses, with the help of photosynthesis. Then you had the development of higher biological organisms, and then finally, with the coming into being of mankind, mankind started to occupy that landmass. In the beginning, they were settling along the rivers and ocean. But then, eventually people had the idea of building canals. One of the first ones to connect rivers was Charlemagne, who started to connect some of the European rivers, an effort which died after he died. But infrastructure development, inward into the continents, was a part of natural evolution of mankind. And that evolution is now reaching, with the World Land-Bridge, that phase where we can open up all land-locked areas in all continents, for human settlement and habitation. And naturally, as the great German-American scientist Krafft Ehricke noted in a very exciting book [The Extraterritorial Imperative—ed. ], the next phase of that infrastructure development will not stop at the planet Earth, but it will extend to nearby space, and the colonization of the Moon. Then from there, operating on nearby planets, asteroids, comets, from Earth, but with instruments which reach as the extension of the human senses, into near space and beyond. So, you have to really look at this development as a long arc, and not say, we can’t do this now. Look at all of this from the standpoint of the future. Think what enormous development mankind has made only in the last 10,000 years, since the last Ice Age, and then you have a completely different view of where we will be in 100 years—if we are not so stupid to destroy ourselves. Where will we be in 10,000 years? And you develop a much more optimistic view on what mankind is capable of doing. Now, I should say that this entire report [see footnote 1—ed. ], and the previous efforts, are all based on the physical-economy theory of Mr. LaRouche. Now, Mr. LaRouche is the only economist who deserves that name, and I’m not saying that because I’m his wife, but because he’s on the record of having been the only one who forecast every economic collapse, and every economic downfall, since 1971; but his first forecast was done effectively in the ’50s. And he was always correct, while all the so-called monetarists—the Vienna School, the Keynesians, the Chicago School—they were all mistaken. And they’re using mistaken methods, because they’re using statistics. They’re using algorithms, one of the most absurd inventions ever, because it’s the idea that you can predict human behavior on the basis of past behavior, which is completely crazy, because it eliminates creativity. We are not robots, we are not machines, but the human species is the only species which is capable, again and again, to discover universal principles in science, in art, and in that way transform our mode of existence, by applying the results of these discoveries in the production process. And as you do that over a longer period of time, you increase the productivity of the production. You increase the productivity of the labor force. And you increase the living standard and the longevity of mankind. That is uniquely what human beings, contrary to all other living species, can do. And Mr. LaRouche has developed a metric of how one measures that, and that is called energy-flux density. Because there is a direct correlation between energy-flux density applied in a production process and the living standard and the population density which can be carried at each point of the development of this process. Now, most of you know the tragedy by Aeschylus, Prometheus Bound. This is a beautiful story, and it’s not a myth, but it is the first, at least in writing, transmission of what technology and science can do for mankind. Because in this play, Prometheus describes, very, very beautifully, how the fire which he dared to bring from Olympus to mankind, transformed the mode of existence of human beings, by allowing for instrument production, agriculture, navigation, and all kinds of other benefits. And naturally, the evil god of Olympus, Zeus, chained Prometheus to a rock forever, having an eagle eat his liver as a punishment. But Prometheus never regretted that he had done that [brought fire to man—ed. ], because he loved mankind. And Friedrich Schiller said that that quality of Prometheus, of not regretting that he did that, despite the fact that he was tortured for eternity—that is the ability of mankind called the Sublime: that you stick to a noble principle, despite the fact that the evil oligarchy is trying to move against it. 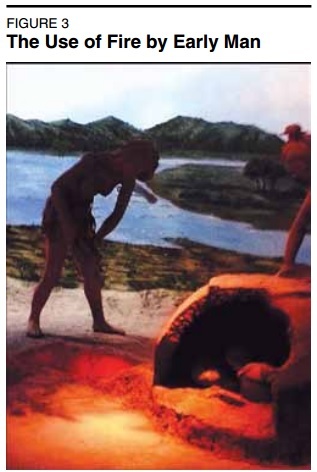 This is a picture from a museum (Figure 3, I think it was in Lanzhou, in China, which I had the fortune to visit this August, and they show, on the left side, this reddish spot is a fireplace; and there is a nice museum which shows actually, how, with the help of fire, mankind was able to really start to cook his food, start all kinds of techniques; so it was a big, big breakthrough, because if you don’t have fire, naturally you have a very low productivity. Now, if you think about the successively higher forms of chemical fire, you have the development from using wood, then you go to charcoal, to coal, to coke, eventually to fossil fuels, petroleum, natural gas, and these each time open up new technologies. So it was not just the higher energy-flux density in the fuel, but it always opened up new technologies, like metallurgy, new materials; and when you go to fission, and finally to fusion and matter-antimatter reactions, you will have an enormous change in the mode of production. Thermonuclear fusion will be the absolute change, because then you will have for the first time, energy and raw materials security, because we can just use garbage and turn it back into raw materials. So that is the way to go. 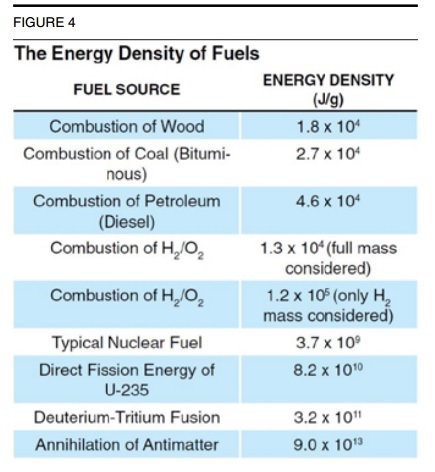 Now, if you look at the next slide (Figure 4), if you look at the increase of the energy-flux density, man without fire only has muscle to use, and then his capacity is about 100 watts, which is not very much. Now, 200 years ago, at the time the United States was founded, you still have a wood fire economy, that provided an estimated 2,400 to 3,000 watts per capita, which is already 30 times higher energy use than before the use of fire was invented. Around the year 1920, when you had coal power, it was 5,000 watts, which was double the amount of the wood-powered economy, which already enabled powered machines, transportation, early forms of electricity, and modern chemistry. And with each move upward, that which was used as a fuel at the previous level, then could be used for other things. For example, you could use coal for chemical production; you can use oil, petroleum, such things, for chemistry and other things. And you’re not wasting it by just burning it. Now, today, obviously with nuclear energy, the whole issue of rare earth [elements] is becoming much more important. Go to the next slide (Figure 5). 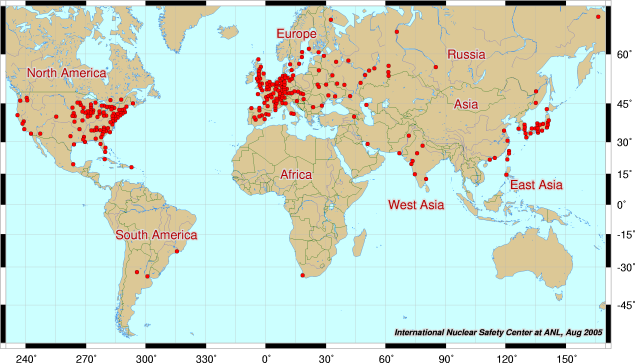 This is the map of the nuclear power plants distributed around the world. 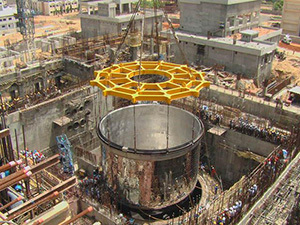 (Figure 6): This is an Indian prototype reactor. 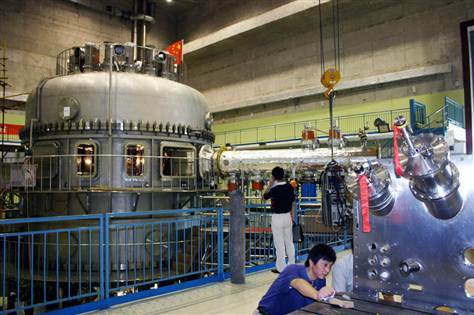 Next (Figure 7): This is the Chinese EAST [tokamak] reactor. 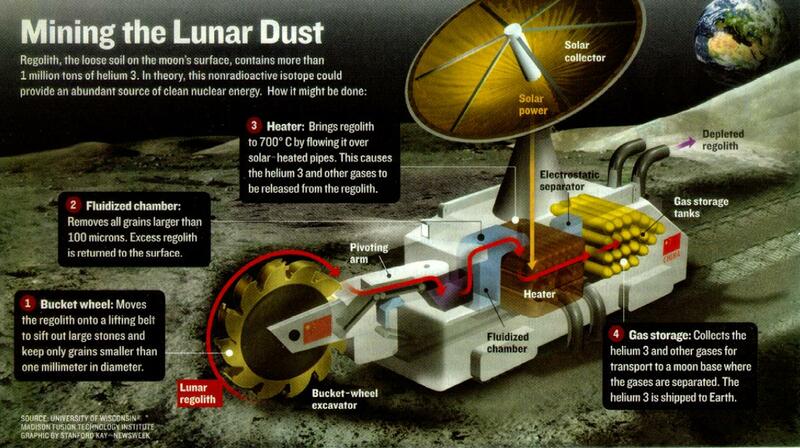 Next (Figure 8: And this is an artist’s rendition of the mining of helium-3 through the Chinese lunar missions. As you know, China made a tremendous breakthrough last December, by landing its Yutu/Chang’e-3 lander on the Moon, and it is now planning to accelerate that with the aim to, in 2017, start bringing materials back from the Moon. And that is supposed to mine very large quantities of helium-3 on the Moon for future fusion production on the Earth. And as I said, fusion technology is the absolutely necessary next step, in the evolution of mankind, because, as I said, it not only will mean tens of thousands of years of energy security, but it will also mean raw materials security, and therefore, will eliminate one of the big areas of tension in the world, namely, scarcity and hunger and poverty. With fusion, the power rates for an average citizen in the United States would go up to 40,000 watts per capita, and if you compare that to an average of 2,400-3,000 watts, which is about the level of what the United States had 200 years ago, you can see the enormous need to have more energy production and high energy-flux density. Now, Mr. LaRouche has also developed a unique measuring rod, to determine if an investment is productive or not. And that is the correlation between the energy-flux density and the potential relative population density, which is made possible through that level of energy-flux density. The category of “relative” refers to the quality of the land, and the improvements made by human beings to it, and the “potential” level means what can be accomplished through higher energy-flux densities. Now, each level of such development is always restricted by the physical principles which are known to humankind at that point, and the ability to implement them; and obviously, each time you have a breakthrough, it redefines the entire economic platform. So each time you reach a qualitative breakthrough, every single aspect of the economy is being redefined. So therefore, if you look at the development of the breakthroughs of the last 10,000 years: You developed physical chemistry; this transformed agriculture, irrigation, modern science, as it was developed in the period from the Middle Ages to modern times, through such thinkers as Brunelleschi and his construction of the Cupola of the Cathedral in Florence, which was a completely new breakthrough in architecture; the scientific basis for all modern science developed by Nicholas of Cusa; the discovery of gravitation by Kepler. And then, if you think that we are now really at the verge of reaching a completely new paradigm of civilization, where mankind will no longer only look at the planet, but we will look at the planet from the cosmos, from the laws of the universe, from the idea how does the Solar System function; what can we do from the standpoint of space research to protect the planet? And then we will no longer have so few astronauts that we will squabble over so-called “geostrategic interests,” but that we will define the common aims of mankind, and really grow up as a human species. One very big problem which we have to solve in that, is the scarcity of water. 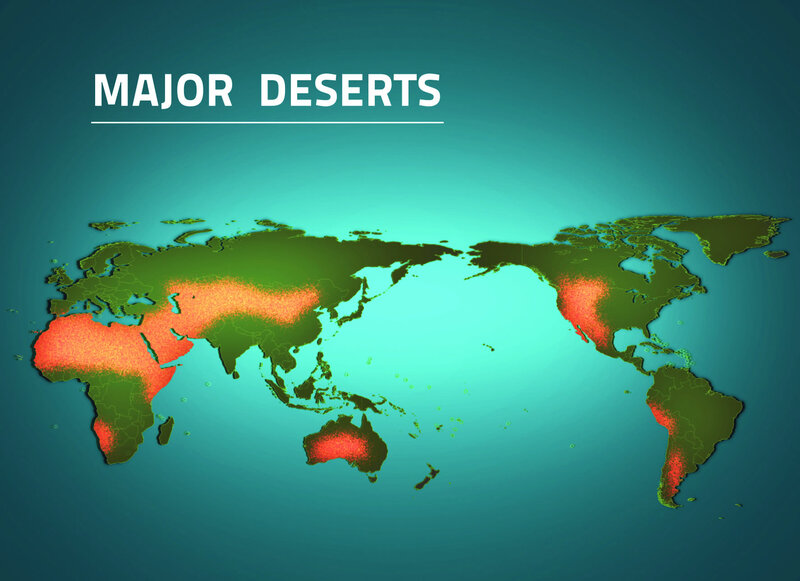 Here (Figure 9), you have a map of the major deserts in the world, and you can see that from the Atlantic coast of Africa, all the way—the Sahel zone, the Sahara, the Arab Peninsula, the Middle East—all the way to China, you have one gigantic strip of desert, and that desert is growing. And it has been growing since the end of the last Ice Age. So then naturally, you have other deserts elsewhere. Now, this creates a problem, because not only the desert, but also the desolate condition of many countries, mean that presently 4 billion people—that is more than half of the human species—do not have safe drinking water, or water for sanitation. Now obviously, that impacts food production, it limits the industrial capacity, and the industrial capacity today is already much below what is needed to nourish and maintain the livelihood of 7 billion people. Seventy percent of the Earth’s surface is covered by oceans, so we don’t have a lack of water. It is the question of how we manage this water, and how we use this water. So this 70% is 100,000 times what the U.S. population uses, in terms of water, during one year: So it’s plenty of water. Now, water, contrary to other raw materials, is not a finite source, which you use and then it disappears, but it functions in a cyclical type of characteristic, where it’s moving constantly from one state into the other (Figure 10). You have it in the form of liquid water in the oceans; it’s frozen on the icecaps; it tends to become atmospheric vapor once the Sun heats it up, and then it precipitates and goes back to the oceans. It participates in different processes in the oceans, in living bodies, in production processes and so forth. And, with each new development, and each higher energy-flux density, moving from fission to fusion, we are now, for the first time, in a position where we can manage the entire cycles of continents, of water transformation, and also create new cycles. With desalination, which will be possible in large quantities through fission already, we can green the deserts. As part of this World Land-Bridge report, we have designed a program, whereby, if you take the entire area from the Caucasus to the Gulf States, from Afghanistan to the Mediterranean, which is essentially desert, and you apply the use of aquifers, the redirection of rivers, and the desalination of large quantities of ocean water, you can reconquer the entire desert. And you can also develop the precondition for new cities, for infrastructure. And the aim is to provide eventually an infrastructure of the density like we have it in Germany. Germany is a perfect model—it’s now becoming less so, but it used to be a perfect model of integrated infrastructure of river systems, like the Rhine; then you have river ports; then you go to container trains, and only the end goes by truck. You should not block the highways with trucks: It’s bad for everybody, including your nerves and your health, and so forth! So we will be able to do that, and with fission, but especially with fusion, we will do what the great Russian scientist Vladimir Vernadsky prescribed for mankind: that we will start to take over the job of the Sun on Earth, that we create weather cycles, and transform the surface of the planet. This is urgent. This is not just some nice academic idea. If you think that there are 900 million people who have no safe water to drink; you have 2.6 billion who have no sanitation systems, due to a lack of water, and this already abysmal condition, which is not worthy of the dignity of man, is made worse by insane techniques, like fracking, which is really completely stupid from a standpoint of physical economy. You use a higher form, namely water, to extract a lower form! And it’s simply, economically, a very short-sighted thing; and, even more criminal, or equally criminal, the use of food, in a starving world for fuel—biofuel! If we want to create new water, as I said, in many cases we can tap into the aquifers, which are many, and I don’t have a map here, but there are known aquifers with large quantities of water, in all continents. But the problem is, it replenishes too slowly for the pace of human development. There is also an enormous amount of freshwater precipitation over the continents, but it’s very unevenly distributed, and the only way you can remedy that is by the development of basic infrastructure. You have to build canals, dams, reservoirs, pumps, irrigation, water purification, sanitation and so forth. And that is also extremely underdeveloped in many continents. There are two or three examples of large-scale water management; one was Franklin D. Roosevelt’s Tennessee Valley Authority project, which still is in part functioning today; but in the present day, there are only two ways to resolve that water shortage: One, again, is China. 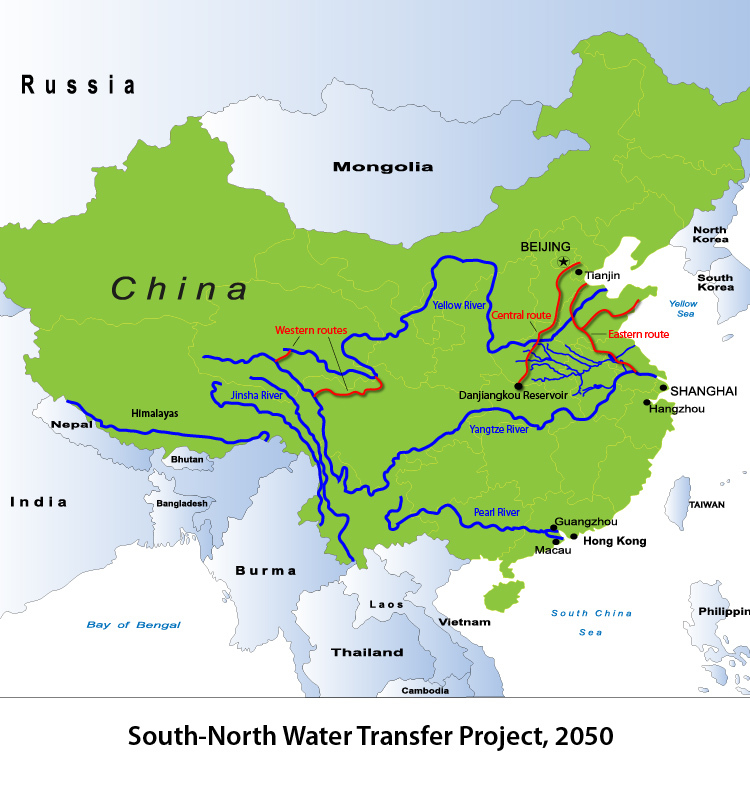 The China South to North Water Transfer System (Figure 11), which is a proposal which we made in ’91 in our original Eurasian Land-Bridge concept; and in the meantime, China is well along in doing that, by redirecting the flows of the Yangtze headwaters Fountain Spring area, which is very rich in water, and redirect that to the Huang Ho [Yellow River] basin. And it has different routes: The eastern route became operational in December 2013, and brings water to the eastern provinces of Jiangsu, Anhui, and Shandong; by the middle of 2015, the Middle Route Project will be completed, which will bring water to Beijing and Tianjin and the neighboring regions; and this September, testing for this began. And the Western Route is still in the planning stage. Now, very excitingly, at the recent SAARC summit in Nepal, Prime Minister Modi announced a similar gigantic project for India. He discussed the feasibility of linking the Sharda River, which flows through the Himalayas, north-south along the Indian-Nepal border, with the waters of the Yamuna River, which flows from west to east in the Ganga Valley, and the Prime Minister of Nepal, Sushil Koirala, agreed that India and Nepal would build this together. This all goes back to the time of Indira Gandhi, with whom, as some of you know, we cooperated on a 40-year development program for India at the time, namely, a National Water Development Authority, which she initiated in 1982; and that institution had worked out a proposal to have 30 rivers in India linked through canals, to build up storage structures, for example, 3,000 storage structures, to build a canal of almost 10,000 miles long, and all of these projects were designed to create 34 GW of hydropower, irrigation for 35 million hectares of agricultural land, to transfer 175 billion cubic meters of water per year. And that would have tremendously increased food production, protected the population against floods and drought, and reduced the imbalances of the water precipitation in the different regions. And Prime Minister Modi just has announced that he wants to revive all that. So I think this is absolutely fantastic. Let me just spend a couple of minutes on the Chinese economic miracle, because that is key to understand the tremendous potential all of this has. China has completed an economic miracle in 30 years—what many industrial countries needed several centuries to accomplish. What Europe, the United States, needed 200 years to do, China did in 30 years. I was, for the first time in China, in 1971, in the middle of the Cultural Revolution, and China was completely undeveloped. I was in Shanghai and Beijing, and other cities, and for 100,000 bicycles, you had 1 car. And it was totally undeveloped. And if you go to China now, especially since the economic reforms of Deng Xiaoping, China has completely changed. Admittedly—and the Chinese government is the first to admit that—there were some mistakes made in the beginning of this development, when China accepted to be a place for cheap-labor production for the export markets of the United States and Europe, which has resulted in some environmental problems which now need to be corrected. But since about 10 years ago, I would also say that China has moved more and more away from simply copying other countries’ technologies—and nobody should make a big fuss about China copying technologies; as long as the NSA shoplifts technologies around the globe, I think we should better leave that issue aside! And also, you know, every country does that! 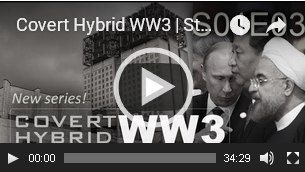 It’s simply a known secret that every country does it, so don’t make a big fuss about it. But since about 10 years ago, in many important areas, China has moved away, and is becoming an inventor of new technology! And the best example is the already mentioned Yutu and Chang’e lunar mission; China is now very ambitious to become the leading space nation in the world, maybe together with Russia and India, by the year 2030. But I think they are on a good track to do better than that. China therefore is pursuing a science-driver approach and puts a lot of emphasis on higher education of its young people. Just to mention a couple of the extraordinary infrastructure projects of the last two decades: China has built the largest dam in the world, the Three Gorges Dam, which opened in 2008, which is generating 22,500 MW of electricity per year, and also helps to control the floods on the Yangtze, and therefore saves the lives of thousands of people. It has built an 11,028-km-long high-speed-rail track since 2000, and will have completed 18,000 km by 2015. And I can tell you from my own experience, China has now developed a high-speed-rail system which is really the best in the world. I traveled from Beijing to Shanghai on a Chinese-made high-speed train which was more quiet, more calm, more steady, than any other train I have ridden on in Europe or the United States, ever. So I would say that the Chinese fast-train system is the trademark for China, like what the machine-tool is for Germany. I think the fast-train system is, for China, like the poster child. It has also the only commercial maglev in the world, from Pudong to Shanghai inner city. It has the greatest water-transfer program in the world, which I just mentioned. And it has expanded the manufacturing workforce from 85.9 million in 2002, to 105.9 million in 2012, which is now three times the labor force of the U.S., Japan, and Germany combined. And, the workforces of these three countries declined in the same period by 10%, down to only 32.9 million. China also has started, in the last decades, to built 100 new cities of up to a million inhabitants each, and they have a commitment of building 100 more new cities by the year 2020. They have already built 21 nuclear power stations, with 28 more in construction, which will triple the nuclear production by 2020, at which point, it will still only mean 6% of the entire energy requirements will be coming from nuclear, compared to 74% in France, for example; but compared to the zero percent in Germany by the year 2020, it will look very good. And I’m very unhappy about the exit from nuclear energy, which is one of the two ways Mrs. Merkel is destroying the German economy. And people are culturally very pessimistic, through the paradigm shift which has taken place in the last 50 years, especially since the assassination of John F. Kennedy, who was the last President who had that kind of a policy for the United States. Remember the Apollo Project; remember the idea to overcome poverty in the developing countries, which Kennedy was in the process of doing. That all stopped with the his assassination. And the takeover of more and more banking interests, more and more environmentalism, greenism, which has resulted in the present desolate condition of Europe and the United States. Therefore, because people are living under this kind of a world outlook, they cannot imagine that what China is offering, and what the BRICS countries are offering, is something different. They say, “There must be an evil plan behind it! China is trying to take over the world! India’s population will outnumber the world soon, all by itself!” So they cannot imagine that there is a completely different philosophy. But I insist that there is, and I would like to challenge all of you, to look at it, yourself: Look at the policies of Modi. Modi, for example, recently made a beautiful speech, where he said the BRICS represents the first time there exists an alliance of countries which is not bound by their present capacity, but by their future potential. India has a very young labor force—I think 60% are under 30 years old, something like that—it has an unbelievably young labor force, which is now in the Modi revolution: the idea to educate them, and then provide a labor force for other countries which have demographic problems—like Germany, for example, which is shrinking; Italy, Catholic Italy is shrinking! They have the lowest birth rate in Europe, maybe even in the world! So India is offering to help there. And I have come to the conclusion, that what especially President Xi Jinping expresses—and I have read many of his speeches, not all of them, but a lot of them, and I looked at his policies—and I have come to the conclusion that China right now is engaged in reviving the 5,000-year-old history of China, by not focusing only on the creation of the People’s Republic after ’49. For example, China is involved in a major restoration of ancient cultural treasures. For example, I visited, in my trip in August, the Dunhuang Mogao Grottoes, which is a Buddhist grotto spanning over hundreds of years, or even more than a thousand years, and is one of the great relics of the Buddhist religion. They’ve digitized images from these grottoes, so that more and more people can go and study the ancient history. The ancient Silk Road is one of the most exciting things to look at (Figure 12). 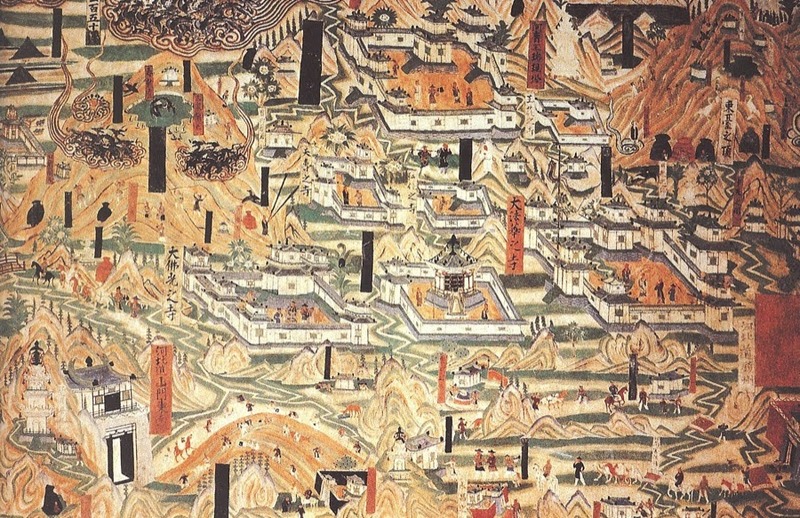 The ancient Silk Road was an exchange of goods, but also technologies: silk producing, porcelain producing, gunpowder, paper-making, book printing—technologies were exchanged! Knowledge was exchanged, and brought all participating countries forward. The same goes for the New Silk Road, but with modern technologies: Fusion power, space travel, and other vanguard technologies will bring mankind forward. Xi Jinping recently had a major conference in Beijing, meeting with the foreign policy bodies—the Politburo, the Standing Committee, all the major bodies—and he laid down a comprehensive approach of Chinese foreign policy, which has many elements. It has the Silk Road, the Maritime Silk Road, the BRICS collaboration, the new model for major power cooperation, and all of these are based on principles which we in Europe knew from the Peace of Westphalia: the absolute respect for the sovereignty of another country; the non-interference; not using your own advantage to overpower another one; and just have the kind of peace basis the world now needs! And this is very much in line with Confucian philosophy, which after all, was created by Confucius as a reaction to the previous period, when China was involved in wars and disunity; and therefore, the key philosophy about the Chinese outlook is the desire to have a harmonious world. That’s what people don’t understand here, but I can assure you, I have enough of my own experience and studied it, and I can assure you it is exactly what is true. China has completely rejected the 10 years of the Cultural Revolution, and never wants to have again such a disruption of society, and wants to really have harmonious relations with all neighbors and all countries of the world. The same goes for India: India has a beautiful, almost 5,000-year-old history, going back all the way to the Vedic writings, which have fundamental principles about the order of the cosmos, and why the political and economic conditions on the planet must be brought into cohesion with the laws the cosmos, the laws of the physical universe. And these countries believe that! It’s their philosophy! If you don’t believe me, I would challenge you to study it, and remedy and correct your views which come from the Washington Post and such papers. And they’re really not truthful at all. The German philosopher Hegel, who I normally don’t like, because he was a step down from Friedrich Schiller, but he wrote in his Phenomenology of the Mind, one sentence which I think applies, and that is that the servant, the lackey, the valet—der Kammerdiener—cannot imagine that his employer, whom he serves as a valet, can be a world-historical individual. And Hegel says: This is not because the world-historical individual is not a world-historical individual, but because the valet is a valet. And that is, I think, why the Europeans and the U.S. cannot imagine that these countries are different. So I think that that is the reason. And what we have to do is we have to organize reasonable forces, in Europe—and you wouldn’t believe it, but there are such forces, despite the present appearance of Mrs. Merkel, for example, who has joined Mr. Cameron with her confrontation against Russia—I think it’s very stupid and bad. We have to talk to the industries, to trade unions, to many, many other groupings and tell them: Look, why don’t you join? Join the BRICS, join the Silk Road and join the reconstruction of the planet, and let’s move together to the next era of civilization, which is the next phase of evolution, in which the identity of mankind will be more and more that of a creative species. And I’m absolutely convinced that we have to come to this kind of collaboration on the common aims of mankind, and define the present from the future; that we think, where do we want mankind to be in a hundred years from now, in a thousand years from now, in 10,000 years from now—and we want mankind to exist then, don’t we? Then, let’s throw overboard all these stupid axiomatic assumptions which presently conduct policy, and which are bringing us to the brink of extinction, because we are close to that if this stuff against Russia and China continues. I think what is needed, therefore, in the United States, is exactly what Prime Minister Modi called for for India, “a mass movement for development.” I think we have to intervene; for example, we shouldn’t have marches because of Ferguson; what happened. This will not remedy the situation. But if we would bring development into the United States, into Mexico, into the Caribbean, into Latin America, where it is already happening, all these problems would be solved! The problem of the United States is not race. Sure, you have racial conflict, but if you would have the same kind of excitement, like we see right now in China, in India—in India right now there is complete enthusiasm about what Modi is accomplishing—if we had that in the United States—. You have right now droughts in California, in Texas; there are now many towns where you have water being brought in to distribute, because it’s already dry! People are setting up mobile showers, for people to be able to shower. They’re transporting hundreds of thousands of beef cattle, because there is no grass any more there. Don’t you think it would be time to have real development projects, as we see in China, in India right now? Can we not build a hundred new cities in the United States? Or at least five, I mean, let’s start modestly: five new cities, science cities, beautiful cities: Give people hope! Right now! Let’s close down Wall Street and create hope in the United States. 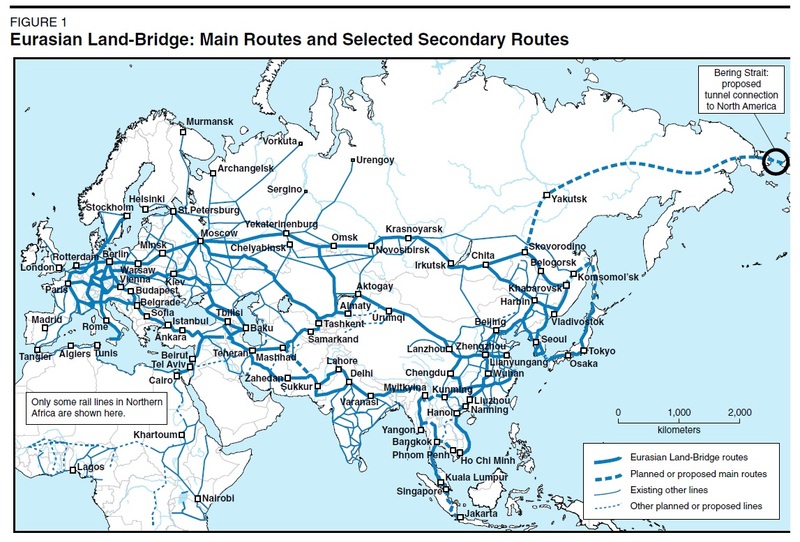 EIR Special Report: “The New Silk Road Becomes the World Land-Bridge,” December 2014. Waw, the future of my son sure looks wonderful, this gives so much hope!